Dark Fury squads are the quintessential Raven Guard. 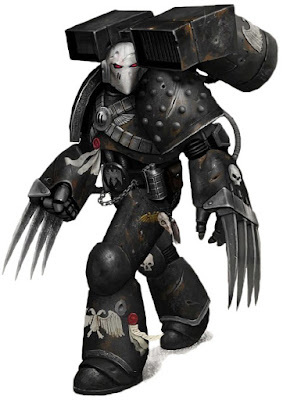 There simply is nothing more iconic than jump pack, lightning claw, Raven Guard marines. So let's take a looks at these guys. First off, they are Raven Guard, so they get furious assault on the charge, it's not the over top but it's a nice little bump. Second, they get the option to upgrade to Raven's Talons for 10 pts a model, which gives them rending and master crafted. It's a pricey upgrade but opens up the option of hunting all legion's elite units. The new codex gives them ALL raven talons for free! YAY! They come with lightning claws, frag & krak grenades and jump packs, but the interesting thing to note is the base 2 attacks. Fateful Descent: Gives them a 5+ cover on the turn them deepstrike. So they are a pretty tight little package. Each guy is throwing out 4 I5 attacks on the charge with re rolls to wound. From a cost perspective it's a deal in 30k terms. A standard Legion Assault marine in a 20 man squad starts at 20 points and hits like a wet noodle. For the 10 points you get +1 attack, 2 lightning claws, Sudden Strike, and fateful descent. A comparably equipped command squad member would be 63 points with the special rules, so you are getting close to a 50% discount. But are they good? It's a tricky question to answer. A naked squad is going to run you 175 points and you will murder basic infantry if you can get them into HTH. But lots of things murder infantry in 30K. 1 typhoon is probably better than 10 dark fury. Another thing to consider is timing. If you start them on the board they will likely get shot dead before they get there. If you deepstrike them, they are coming in turn 2 and assaulting turn 3, at the earliest. Angels of Wrath: Gives you hit and run, which is huge. Hit and run can be used in a lot of ways: Escaping bad match ups. Sling shotting to other parts of the board with extra movement. Bouncing in and out of combat to pick up extra attacks, furious charge and +1I. So you can see that Angels of Wrath can really turbo charge these guys. It should also be mentioned that this works well with melta bomb toting standard jump packers, as the two units basically threaten every unit in the game. Decapitating Strike: Preferred enemy on ICs is a nice pick up. It probably won't make much of a big difference, but these lists tend to alpha strike, which works well for these guys as they come in later and clean up damaged squads. Alvarex Maun: His strato-vox gives a pretty big range for scatterless deepstrike. I find I'm often using him or running a second vox to bring these guys in. He can also take cameleoline, so the dark fury come in and Maun runs up and joins the squad giving them a 4+ cover, or +1 to any cover they already have. It's a good way to keep them alive unit the next turn. Chaplains: Fearless is always a welcome rule but the re roll to hit in first round of combat is really where these guys get good. So 105 pts gives you a re roll on 20+ attacks on a charge. If you are running relics, it also gives you a spot to run a personal void shield, which is sweet since you bounce basic fire arms. Librarians: Libby's are often overlooked, but it's an interesting upgrade for dark fury as the libby can soften up targets or be a multiplier with invisibility or even boo units of the board with terrify. 5 Dark Fury, 1 with melta bomb. At 180 points and a small footprint, you can often deepstrike this squad into LOS blocking terrain. I bought 2 Calth Boxes... What legion do I build!